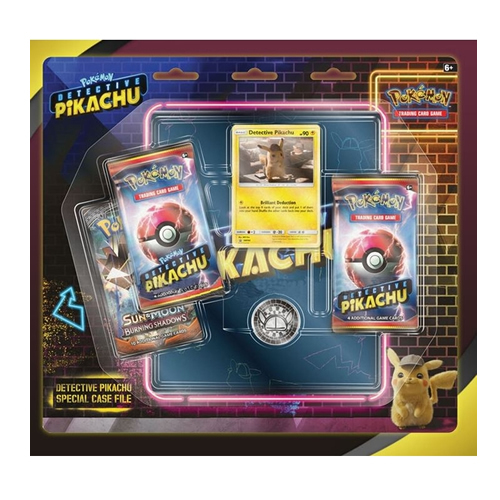 • Celebrate the Detective Pikachu movie with a promo card and coin featuring Detective Pikachu. 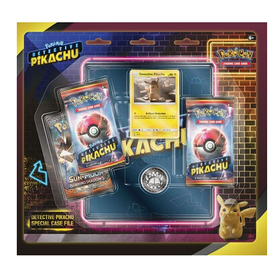 • Each detective pikachu booster pack contains a total of 4 cards. • Includes a code card for the online Pokemon TCG game. • 1 x Promo card featuring Detective Pikachu. • 1 x Detective Pikachu Metallic coin. • 2 x Detective Pikachu booster packs. • 1 x Pokemon TCG booster pack. • 1 x Detective Pikachu 4-pocket binder. • 1 x Online code card.